Today: Homemade pasta? For a dinner party? Let your friends help you. Here's a step-by-step plan. Making homemade pasta -- if you're one to ever, ever attempt it -- feels like a weekend project: a project for a lazy Sunday afternoon, when sunny-yellow dough hanging in every open space feels like a welcome decoration, when flour all over the kitchen feels fun and lovely and not sweat-inducing. And I'm telling you to make homemade pasta on a weeknight. I'm telling you to make homemade pasta, on a weeknight, for a dinner party. Roll your eyes until you look at Grandma DiLaura's Italian Ricotta Gnocchi, and then you'll see that making homemade pasta can really just mean dumping a few things in a bowl, stirring it, and having your friends roll it around like preschoolers. After a few minutes, you'll boil up their masterpieces. You'll round out the meal with radish toasts and salad and greens and rhubarb-strawberry ice cream sundaes. And you will feel like the greatest and most domestic and impressive host in the world, when you really just had your guests do the work for you. The night before: Make Marcella Hazan's Tomato Sauce with Onion and Butter, and stick it in the fridge. 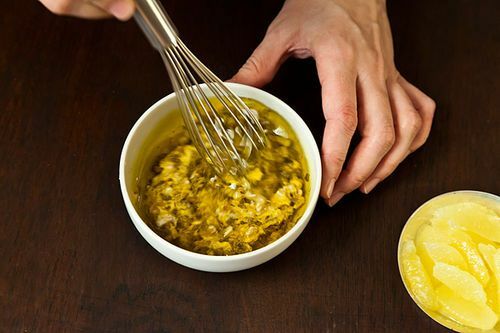 Prepare April Bloomfield's Lemon Caper Dressing, leaving the lemon segments in a separate container. Those will be added in right before serving. 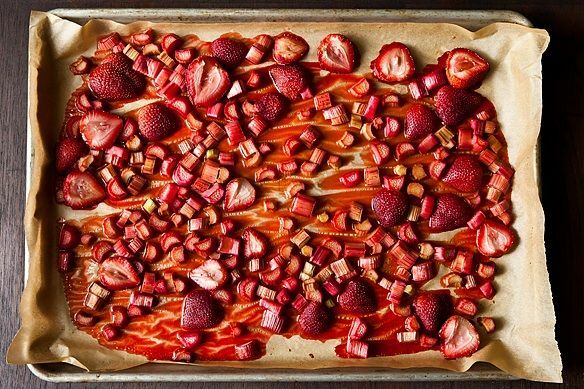 As soon as you get home from work: Chop your strawberries and rhubarb; get them ready on a baking sheet. Wash your lettuce; clean your greens. An hour before your guests arrive: Make the almond salsa verde, and keep it at room temperature. Get your radishes roasting. 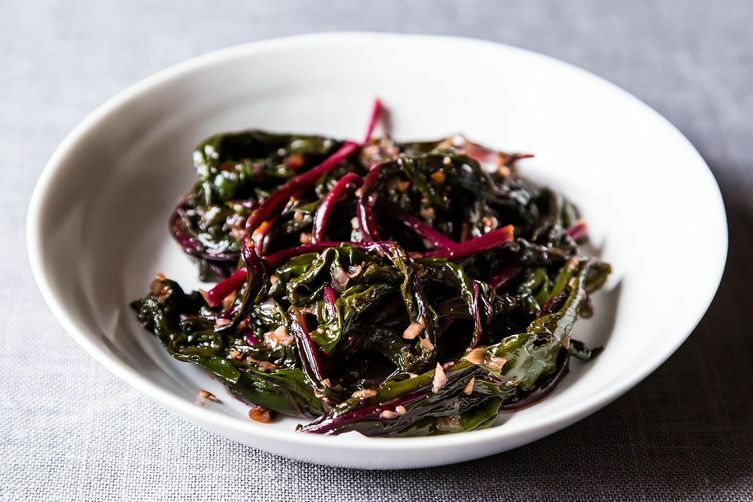 Cook up your Pink Greens, and leave them covered on the stove; you'll heat them up before serving. 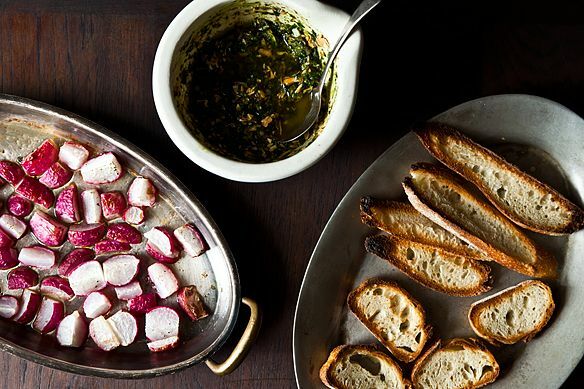 Ten minutes before the party: Toast your bread; you'll set out your toast with the radishes and salsa verde. Your friends can build their own appetizer. When your guests arrive: Stir together the dough for your gnocchi, and bring it out to the table. Let everyone roll and cut and pinch their gnocchi; have wine at the ready. 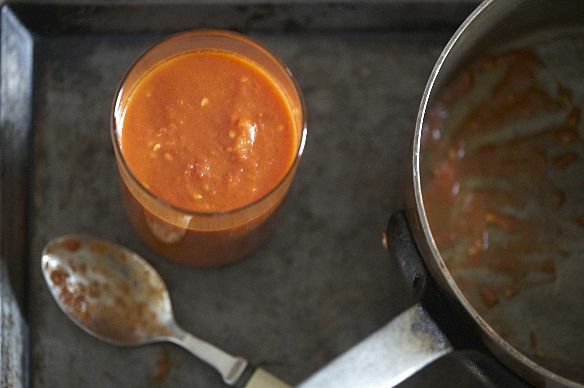 Get your tomato sauce heating on the stove, and when the gnocchi is gnocchied, get it boiling. Top the gnocchi with your sauce and with cheese, toss your salad, throw your greens in a bowl, and bring it out to your sous-chefs. While everyone's eating: Stick the rhubarb and strawberries into the oven. Head back to the party. Time for dessert: Take the strawberries and rhubarb out of the oven, spoon it over vanilla ice cream, and serve. Love this! And what is in my CSA box this week... strawberries and rhubarb! Now this is my idea of the perfect dinner party. I love this menu! I want to go to this party. And it's totally veg!